Oh my God! 39 comments! We are certainly feeling the love here. 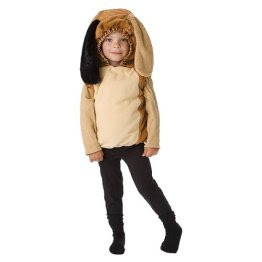 Thanks to everyone who left their vote for Emmylou's Halloween costume. Gary bet me that we wouldn't get more than 18 votes and we got more than double that! I'll enjoy spending the 25 bucks he owes me (sure wish we had bet more). So it looks like Carmen Miranda is the big winner, however, Alex did provide an excellent alternative to my suggestions. Although I'd be happy to never lay eyes on another raisin since they exploded all over my car and house just a short while ago, I do think a California Raisin costume would certainly be appropriate. 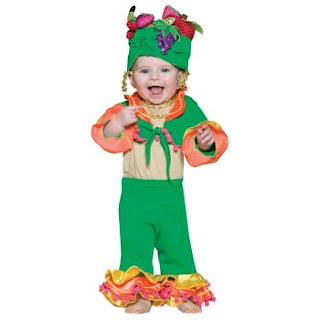 So here's what I'm going to do: I'm going to order the Carmen Miranda costume but also start researching how to make a California Raisin costume since I'm pretty sure you haven't been able to buy one of those since sometime around 1986. And since Lulu had two costumes last year, I figure it's perfectly fine to keep that tradition going. 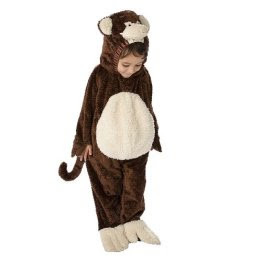 We'll be going to a Halloween parade and party at the children's museum on the 28th where she can be Carmen and then on Halloween night she can be a raisin. God, she is going to hate me in about 15 years, isn't she? At least I can blame it partly on you people! Please leave a comment with your vote, even if it's anonymously or if we don't know you (or if you have a better suggestion than the ones above). Gary and I have a bet as to how many people will vote and I want to win, so get your friends to vote, too! If you've never left a comment before, just click where it says "# Comments" after the posting and you should be able to leave your vote without needing a Google/Blogger account. DON'T GIVE A KID TOO MANY RAISINS! How do I know I gave her too many? Because I saw how many I had to pick up yesterday and last night when she threw up in my car, her bed, and later, my own bed. It was not a pretty sight, and considering that I hate raisins, I'm pretty sure I'll never get over that now. I guess it might have just been a coincidence that she got some kind of stomach bug, but I'm not going to pretend that the previous days' steadily-increasing raisin intake to mammoth proportions didn't have something to do with it. Poor baby. At least she's almost back to normal now! Emmylou's a good eater, and her favorite things to eat right now are raisins. If I didn't stop her, she'd eat her weight in raisins daily. Okay, maybe I'm exaggerating since I found out yesterday at her 18 month check-up that she weighs 22 lbs., 13 ounces. I don't actually keep that many raisins in the house. After putting her to sleep around 8:00, I heard a little fussing around 10:00, but then she stopped so I figured everything was fine. An hour or two later, when I went to sleep, I decided to check on her. Imagine my surprise to open the door and find an empty mattress, and since it was so dark in her room (the light in the picture is just from my flash), it took me a while to see that she had climbed onto the bed frame and was fast asleep half on an old pillow and half on the metal springs. Comfy, huh? Me [phone to my ear]: "Um, yes, you'd like to speak to Emmylou? Well, of course, she's right here, just hang on... One sec." [Handing phone to Emmylou] "It's for you, Emmylou!" Emmylou [taking phone and putting it to her ear]: "Aa-da?" "Uh me jah" [nodding head, very importantly]. After lunch, Emily and I took Emmylou to the Austin City Limits Music Festival (for Emmylou's second year!). Gary was already there and we met up with him for a few minutes as soon as we got there. and then she got a harmonica! Um, she loved that thing. Emmylou's favorite musician was clearly Regina Spektor. She really took notice when she started playing the piano. What a difference a year makes, right? I am in disbelief that you are eighteen months old now! Yesterday was a big milestone, but even if we weren't counting the months since you arrived, I'd still know that you are really growing up. Somewhere between seventeen and eighteen months you really changed. And thank God we took you to Europe before that change. These days you know exactly what you want but usually have a hard time getting it. You end up getting frustrated because you don't have the words you need or don't understand why you can't have or do everything your little heart desires, but I promise it'll get better soon (at least that's what I'm telling myself). Your vocabulary is already expanding rapidly and as we begin new routines, they always seem to get easier with time. A week ago I was convinced I was doomed to listen to your screaming and crying for hours after bedtime until you were at least ten years old, but you've already made drastic improvements. Sure, there's still a little fussing coming from your room, but I also hear a lot of singing and talking, too. Speaking of singing, your favorite song right now is a toss-up between "Row, Row, Row Your Boat" and Amy Winehouse's "You Know I'm No Good." You can start "Row, Row, Row Your Boat" all by yourself by singing "Row, Row Row," (that's the only part you know), but when the Amy Winehouse song comes on in the car after your Music Together CD, you start jamming out and dancing in your carseat every single time. And speaking of Music Together, we just started a new semester of classes-- I can't wait to see you learn all kinds of new things and watch you enjoy yourself there every week! This past month we learned a couple other things about you, mostly that you are seriously frightened of drills, hair dryers and dustbusters. I don't think we'd ever seen you scared before! Although I hate for you to feel this way, I secretly love how you hold on to me as tightly as you can when you come face to face with any of these things. But lately you've been super affectionate with me and Daddy (oh, and Lola, too), so I promise not to torture you with small, moderately-loud appliances just to get some free hugs. I hope you know that although things aren't as easy as they were a month ago when you were Miss Laid-Back/Go-With-The-Flow, I love watching your personality grow and seeing you beginning to develop into what I can only hope is an independent, strong and confident little girl. I know there are still thousands of tense moments to come, but I hope we can both meet them with a sense of humor, keep some perspective and enjoy all of our time together. You are still the sweetest thing to me, my most favorite person in the entire world, and I love you with every bit of my heart, forever and ever. We had to convert her crib to a toddler bed! This weekend at the lakehouse after being put in her Pack 'n' Play for a nap, she opened and walked out the bedroom door only moments later. Then, last night when I tried to put her down, she shamelessly threw her leg over the crib rail and tried to hurl her body overboard (she didn't even wait until after I had left!). Since it's a long way down to the very hard, wood floor, we figured the best thing to do was to take that option away. But let me tell you, life has already changed drastically. Long gone are the days of simply throwing a completely surrendered, sleepy girl into her crib and enjoying hours of silence from that moment onward. No, now we have a fighter--a screamer--and Gary and I are using terms like "cry it out" and "setting boundaries" with each other. Ughh. We're also trying to transition from two naps to one a day now, so that's SUPER. Oh, and don't worry if it still looks like there's a long way for Lulu to fall when she rolls over in the middle of the night. We actually pull the mattress onto the floor when she goes to bed. Since posting the Lowly Worm/Apple Car photos, we've had a couple of happy surprises! Clearly, Emmylou is in love with a fedora-wearing, fruit-driving worm. Thanks, Grammie and Link, you guys rock!!! I swear she wanted the tape on her! And when you're desperate to keep her in one place so the ceiling fan Daddy's installing at Aunt Em's house won't fall on top of her, one tends to give her what she wants! We were out of town pretty much all last week, so I have lots of adventures to report! Later, we met up with Sherry and her boyfriend Kevin at the yummy restaurant Asian Mint. Afterwards, they took a picture with Emmylou which was a real privilege-- Sherry and Kevin don't take pictures with just anyone. We got home on Wednesday and by Thursday were in the car again heading down to the Rio Grande Valley so Gary could go dove hunting. Although we thoroughly enjoyed hanging out with our friends Keith, Ashley and their family and the usual group we see in Brownsville, I didn't take any pictures except for these below. On a rainy afternoon when we couldn't take the kids to the pool or beach, we headed to the mall to ride the carousel and play some arcade games. After absolutely loving riding the merry-go-round horse, Lulu and I excused ourselves from the arcade to walk the mall a bit. It was then, as I turned a corner, that I caught sight of something so wonderful that caused me to stop in my tracks and gasp audibly (maybe letting out an "Oh my God!" as well). 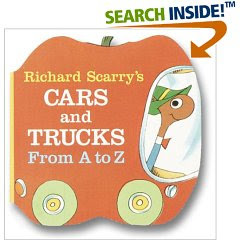 Alongside the coin-operated police cruiser, mini-firetruck and Elmo-mobile for the kids to ride in, was a life-size Richard Scarry Apple Car with Lowly Worm inside!! Please tell me you all know Lowly Worm and his apple car. 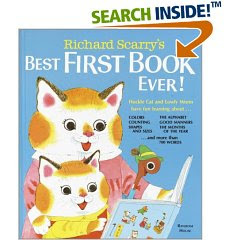 As children, Emily and I loved all of Richard Scarry's books-- I mean, I think we had all of them to learn basic things about transportation, shopping for food, going to school, etc., etc. In fact, I think our earliest moral lessons came from the book "Pig Will and Pig Won't" about two pigs who experience very different consequences when one is helpful and the other is not. And to illustrate just how lasting of an impression these books have been on us, Emily actually suggested a few years ago that "Pig Will and Pig Won't" be the only training manual given to any new employees where she works. Anyway, I can hardly begin to describe how excited I was to see Lowly Worm in his apple car and that my daughter would now have a chance to meet him herself! She must have felt some instant connection to Lowly and his apple car as well, because when I took her out of it and put her back in her stroller, I've never in my life heard her scream so angrily!